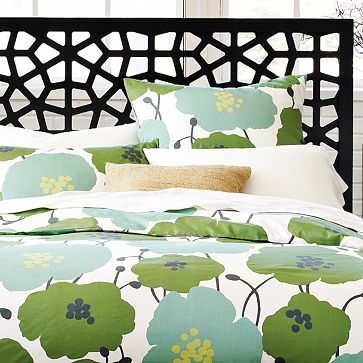 Kudos for this new line of organic bedding offered by West Elm, the American home furnishings retailer. I usually love their designs and hate their quality,but this line of sheets and bed covers sets itself apart from the norm. Organic home furnishings is the latest craze and now it can be found in mainstream stores, I featured towels from Pottery Barn while back. I love the “pin-tuck” duvet shown above. 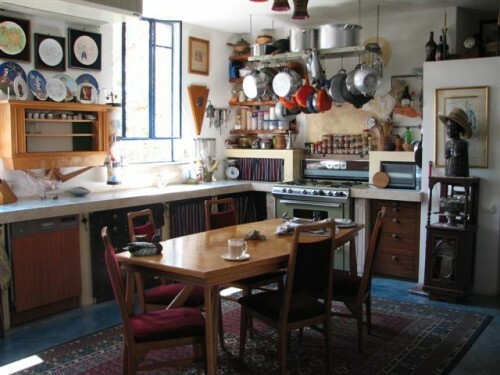 I like sharing well thought out websites when I come across them, Ochre is one of these finds. 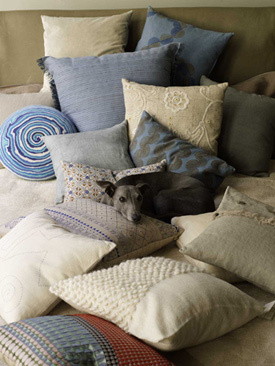 As you can see from the photo above this company makes gorgeous pillows in soft, do-able colors. I found only a few other photos that I could grab for this post but the site is well worth looking at. 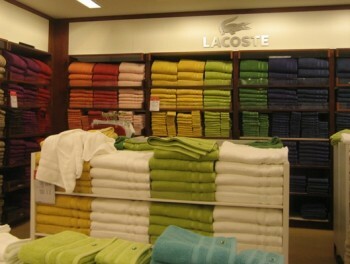 Towel groupings like the ones shown here from Lacoste are a great way to view the latest color stories in designer collections. A visit to Macy’s proved lucrative as a quick overview into some of the collections of top names in home furnishings out today. Unfortunately, I went on the famous ”Macy’s One Day Sale” day and the displays looked like a bomb hit them, but my expert photo cropping got rid of some of that mess. I was able to take a few good shots of the bedding displays and you can get an idea of what’s happening with color in store now. Generally, I try to stay away from West Elm. I love their patterns and styling but the product is a bit cheesy and does not hold up to my stiff standards. With that said, I came across these two patterns that I think look fresh. Giant flowers and moths stand out as another bold statement in home furnishing trends. Would I put this on my bed, I think not (well, maybe the flowers) but it is worth seeing just for the fun of it. Finally! A Place for Etsy’s Weird, Weirder & Weirdest. Most of you who like to buy handcrafted things online are familiar with Etsy. While there are some really great things on Etsy, I must admit, I have stumbled upon some, how do I write this? – OK, I’ll come out and write it – really ugly and badly made items that leave me thinking, who the hell would buy THAT? Someone who is more gutsy and expressive than I am has started a blog called Regretsy which has the byline “Handmade? It looks like you made it with your feet”. And that, my friends, is just the beginning. I have been laughing my pants off reading this blog all week and admittedly though things some people make are totally off the wall and make me wonder about the human race, Regretsy took it a step further and the best thing about this blog is the hysterically witty commentary, which encourages readers comments thereby multiplying the laughter and enjoyment factor. 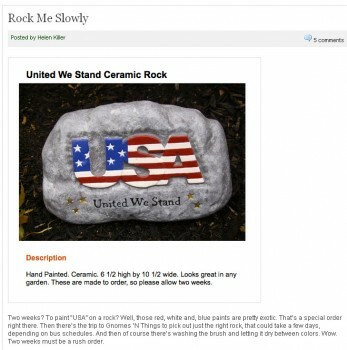 I call this one Patriotic Rock: Maybe they could do one for Israel as well, though the political message may be a little controversial. As far as multipurpose furniture goes, you can never go wrong with a bench or two. The location possibilities are almost endless—put one at the foot of the bed or in front of a window, create communal-style seating at the dining table or group a few together for a modular conversation pit. Today’s offerings are more stylish than ever, with clever storage, unexpected materials and silhouettes to fit every decor. Quite possibly the most brilliant piece of furniture ever, the Cognita bench designed by BluDot for Herman Miller is equally at home in the office or in the bedroom. The upholstered seat lifts to reveal ample space for files or extra linens, while the hard section (which is the perfect spot to place a cocktail, by the way) opens to a removable tray with organizing compartments for smaller bits. 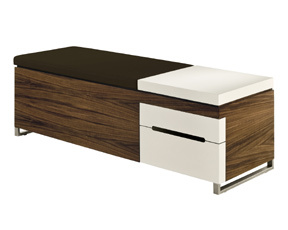 A pair of drawers completes this smart instant classic. 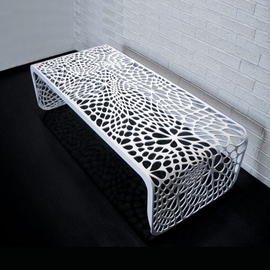 Used indoors or out, Arktura’s laser-cut Coral table is bound to leave a lasting impression. Made from bent steel, the bench has soft lines, and is eco-friendly thanks to its no-VOC powder-coated finish. And the mesmerizing pattern is “algorithmically-generated,” which involves math. 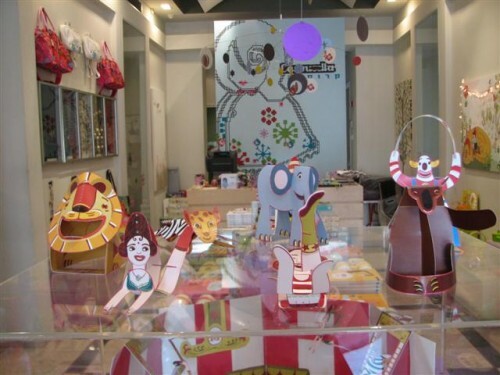 Carousella (warning – site doesn’t work on Chrome, grrrr) is an adorable rather insanely high end kids furniture shop in Tel Aviv. 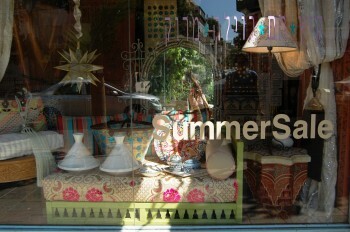 Some of their goods are imported, but the bulk of it is designed and manufactured in Israel. While I love the whimsy of the circus pieces in the picture above I don’t think I would put them in my kids room. My own office, perhaps, but not a kids room. They kind of remind me of the things nightmares are made of. From the runway to the entryway, classic menswear continues to influence everything from women’s clothing (like Alexander McQueen’s luxe houndstooth creation above) to the way we dress our homes. I began noticing this not only from my over-consumption of fashion and interior design mags, but also when I embarked upon my search for the most perfect gray sofa ever (on my budget). Then I got obsessed. And luckily, unlike say, the return of neon, these looks are timeless, not trendy. First things first. The most perfect gray sofa ever (on my budget). 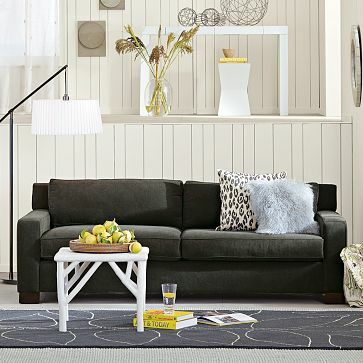 West Elm’s Goodwin collection includes the sofa in two lengths, a sleeper sofa, chair and ottoman. It’s also available in chocolate brown or something, but whatever, because this was the charcoal sofa of my dreams. Can’t wait to check it out (at the cash register) at the Dallas store in October. You just cannot go wrong with a pair of x-base stools. Everyone makes a version and they fit with almost any decor. This Italian leather and chrome pair from Williams-Sonoma Home hits the perfect balance of modern and dapper.